"The course, which mainly weaves its way through Troms, is perfect for punchers, with three stages which appear to favour them. Sprinters will also get a good chance to shine in stage 2." The route of the fifth edition of the Arctic Race of Norway, scheduled for 10-13 August, was unveiled this morning in Oslo in the presence of last year's champion, Italian prodigy Gianni Moscon, and race ambassador, Thor Hushovd. After riding around the Arctic Circle for the 2016 edition, the northernmost cycling race in the world will once again explore the undiscovered wonders of northern Norway. The four-stage route should give rise to different scenarios in which sprinters, punchers and even climbers can shine in front of the roaring Norwegian fans, as numerous and warm as ever. With the 2017 World Championships set to take place in Norway a month later, the stakes will be higher than ever! The Grand Start of the 2017 Arctic Race of Norway will be given in Engenes, a village on the island of Andørja, in a heartfelt nod to the origins of the race. It was their experience with the Tour de Andørja which gave the two founding fathers of the ARN the inspiration to launch a pro cycling race in one of the northernmost parts of the world. After a few kilometres around the island, whose rocks are incessantly battered by the waves of the Norwegian Sea, the peloton will tackle the first two climbs, Lavangseidet (6.2 km at 3%) and Gratangsfjellet (5.6 km at 3.8%). The leg-breaking profile of the second part of the stage will encourage attackers, with the presence of the Skistua climb (2.3 km at 6.6%) a mere 5 km from Narvik, on the same final circuit that, in 2015, saw the Swiss Silvan Dillier took the stage win while Estonian Rein Taaramäe claimed the general classification. Fasten your seatbelts and get ready to fly! The 2017 Arctic Race of Norway will live up to its reputation as a race with a crazy touch. Just like Norwegian fans, who always come up with creative ways of saluting the peloton, the route can be quite unconventional. This year's big new feature comes in stage 2, when the finish line will be drawn on the runway of the Bardufoss airport. Nothing can top this for the fast men of the peloton! Sprinters will certainly try to seize this opportunity, it being the flattest stage of this year's race. The 177.5 km long route will start in Sjøvegan, a village nestled at the end of a fjord, but then leaving its nest for take-off! Thanks to the strong links between the race and the Norwegian Armed Forces, the stage will also feature a wide range of activities, including flight animations at Bardufoss airport. The big air show awaits! On Saturday, 12 August, physical effort will not be the only thing taking the riders' breath away. The peloton will discover the beauty of the Lyngen Alps - the Alps of the North - with their unique snowy summits diving into the surrounding fjords. With a start at Lyngseidet, at the foot of the mountains, the peloton will wander through exceptional scenery during the 185.5 km that will make up this stage. Victory will be decided in Finnvikdalen (within Tromsø Municipality) after a climb of 4 km at 5.5% average. A finish less difficult than the formidable Korgjfellet, where the Italian Gianni Moscon won last year, but this stage should smile anyway to someone who feels at ease on the hills. The grand finale of the fifth Arctic Race of Norway will feature a climactic showdown with a stage designed to light the fireworks on and off the road. The city of Tromsø, which will be host to both the start and finish, will certainly offer plenty of entertainment during a stage packed with symbolism, as it is not unlike the closing act of the second edition of the race. 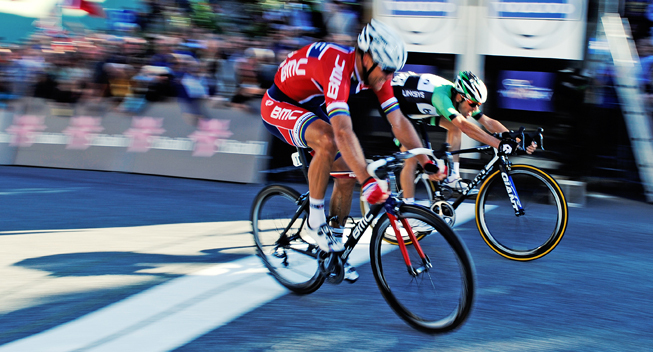 It was here that Thor Hushovd raced in his country for the last time, when only fellow Norwegian Alexander Kristoff managed to pass him on the very last meters before the finish line. However, the sprinters will have their work cut out for them this time round. A relatively flat 118 km loop will be followed by a circuit inside Tromsø with the Prestvannet (1.2 km at 7.5%) and Rostbanken (1.1 km at 7.5%) climbs, which will be tackled four and three times, respectively. Before applauding the all-rounder who wins this year's edition of the Arctic Race of Norway, the crowds will get to follow a performance worthy of their unique enthusiasm for the race! Before the professional race in Tromsø, the Statoil Arctic Heroes of Tomorrow Race will again put the spotlight on the future stars of men and women's cycling. Having become an integral part of the ARN since its inception in 2013, it saw for example the first edition winner, Norwegian Kristoffer Halvorsen, go on to become the under-23 world champion last October. An exploit some would like to repeat with the 2017 World Championships set to take place in Norway! "This year's Arctic Race of Norway is a good mix between the 2014 and 2015 editions of the race, with the same spectacular finishes in Narvik and Tromsø. The course, which mainly weaves its way through Troms, is perfect for punchers, with three stages which appear to favour them. Sprinters will also get a good chance to shine in stage 2, with a spectacular and unique finish on the runway of Bardufoss Airport. Any sprinters who manage to hold on in stages 1 and 4 could also be in the fight for the blue and orange jersey. On a personal level, I'm delighted to see the race return to Tromsø, where I finished my last race in Norway in 2014. Even though I didn't win, I've kept great memories of the fantastic atmosphere and the local support for my last race on home turf."